- 1.5 m from the bank. - The distance between two paddle wheels is 60-80 cm; staggering the paddles. - Depending on the shape of the pond, arrange paddles appropriately to create a better flow and provide enough oxygen for the demand of shrimp. Whiteleg shrimp has a large demand for oxygen. 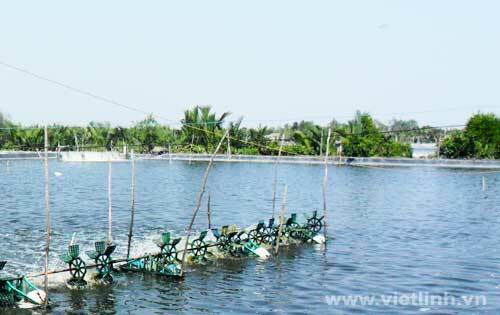 Therefore, it is depending on the stocking density to design aeration systems with paddle wheels, or a combination of plastic paddles wheels aerators with spiral aerators or other types of paddles to provide enough oxygen for shrimps in ponds. The rotation of the plastic paddles should be more than 120 cycles/min (see Table 3). Setting up paddle wheel aeration system and the runtime must ensure the oxygen demand for shrimps in ponds, especially during the evening/nighttime/dawn, when dissolved oxygen levels decrease and are low of the day. It is also needed to enhance the runtime for paddle wheel aerators or add on aeration system for shrimp, especially on prolonged hot or rainy days.